The final decision for cannabis provides for hemp seed oil to be exempt from Schedules 8 and 9 when the levels of total cannabinoids are 50 mg/kg or less. Cannabis and cannabinoids are currently listed in Schedules 4, 8 and 9, and in Appendix D and Appendix K.
"Hemp seed oil" means the oil obtained by cold expression from the ripened fruits (seeds) of Cannabis sativa. in hemp seed oil for purposes other than internal human use containing 50 mg/kg or less of cannabinoids. in products for purposes other than internal human use containing 50 mg/kg or less of tetrahydrocannabinols. in hemp seed oil for purposes other than internal human therapeutic use containing 50 mg/kg or less of cannabinoids. separately specified in the NABIXIMOLS entry in this Schedule. # NABIXIMOLS (botanical extract of Cannabis sativa which includes the following cannabinoids: tetrahydrocannabinols, cannabidiol, cannabinol, cannabigerol, cannabichromene, cannabidiolic acid, tetrahydrocannabinolic acids, tetrahydrocannabivarol, and cannabidivarol, where tetrahydrocannabinols and cannabidiol (in approximately equal proportions) comprise not less than 90 per cent of the total cannabinoid content) in a buccal spray for human therapeutic use. CANNABIDIOL in preparations for therapeutic use containing 2 per cent or less of other cannabinoids found in cannabis. In August 1999, the committee reviewed the status of its foreshadowed proposal to amend the Schedule 9 entry for cannabis to exempt from scheduling cannabis when grown commercially for fibre production and manufactured goods containing hemp fibre. It was seen that such a proposal would provide uniformity in controls exerted by state and territory governments. A general exemption for hemp fibre and hemp fibre products could be made. The committee considered a general exemption for hemp fibre and hemp fibre products could be made. The exemption would allow sale of such hemp fibre and manufactured products in all jurisdictions. In May 1998, the committee considered additional technical and regulatory information relating to a request to exempt from Schedule 9 tetrahydrocannabinols when in hemp seed oil and products for external use when containing 50 mg/kg or less of tetrahydrocannabinols (THC). The committee supported the proposal that hemp seed oil and products containing hemp seed oil should be exempt from the Schedule 9 entry for tetrahydrocannabinols when containing 50 mg/kg of THC and when for external use. In October 2009, the committee considered an entry specific for Cannabis sativa extract, nabiximols, after the issue was raised at the June 2009 meeting that certain jurisdictions were unable to allow SAS access to the substance as it was captured under Schedule 9. As discussed in June, the committee members agreed on the Schedule 8 listing. The committee also agreed that the Schedule 8 entry should limit the allowed presentation to buccal sprays as this would further reinforce the very restricted scope of this entry and would require any new presentation to be brought to the attention of the committee. In May 2010, nabiximols were included in Schedule 8 and Appendices D and K. The committee advised that nabiximols needed to be added to Appendix D, Item 3 to limit access through SAS Category A. This addition would allow restricted access to nabiximols only, not to cannabis extracts, but would not prohibit use for clinical trials provided by an authorised prescriber only. The committee agreed to not restrict the Schedule 8 nabiximols entry by indication (for Multiple Sclerosis). Members additionally agreed that it would be appropriate to include nabiximols in Appendix K due to sedating effects. In March 2013, the committee considered a proposal to reschedule nabiximols from Item 3 of Appendix D to Item 1 of Appendix D of the SUSMP and amended Appendix D to include the entry of nabiximols. In August 2016, the delegate amended the nabiximols entry in line with the August 2016 decision for cannabis and tetrahydrocannabinols to use the plural 's' for tetrahydrocannabinols and their acids. In March 2016, the committee considered a proposal to amend the Schedule 9 entries and create new Schedule 8 entries for cannabis and tetrahydrocannabinols with Appendix D, Part 1 and Appendix K warnings. The committee supported the proposal and in August 2016, the Medicines Scheduling Delegate decided to amend the scheduling entries for cannabis, tetrahydrocannabinols and nabiximols, with an implementation date of 1 November 2016. Minutes of these meetings are available on Govdex (Dashboard/Advisory committee on Medicines Scheduling/Meeting/Minutes). Under the Narcotic Drugs Act 1967 (the ND Act) a 'drug' includes all extracts of cannabis (including hemp) from cannabis plants. 'Extracts' do not include extracts from cannabis/hemp seed. that the drug is a medicinal cannabis product that is registered within the meaning of the TG Act under section 25 of that Act. Therefore extracts of cannabis (or hemp), or the manufacture of drugs from cannabis plants, may only be for the purposes of the aforementioned activities. Extracts for food, cosmetics, veterinary use (including pet food) are not permitted. Cannabis, cannabinoids, cannabis resins, tetrahydrocannabinols, cannabis seeds, cannabis plants and parts of cannabis plants are prohibited imports under the Customs (Prohibited Imports) Regulations 1956. Cannabis and THCs that are in Schedule 9 will not be granted an import permit, unless a State or Territory Health Department agency also authorises/grants the applicant a permission to possess, hold or supply cannabis or THCs listed under Schedule 9 of the current Poisons Standard. Cannabis is a term used to describe a range of varieties of the Cannabis genus. The Cannabis plant produces a resin containing compounds called cannabinoids. Some cannabinoids possess psychoactive properties. Cannabis contains about 60 cannabinoids, of which the main active constituent is delta-9-tetrahydrocannabinol. Delta-9-tetrahydrocannabinol reportedly has anti-emetic properties and has been associated with claims relating to use for the control of nausea and vomiting associated with cancer chemotherapy in patients who have failed to respond adequately to conventional anti-emetics. Another active cannabinoid present in Cannabis is cannabidiol that is associated with claims relating to use as an analgesic, anticonvulsant, muscle relaxant, anxiolytic, neuroprotective, anti-oxidant and anti-psychotic. Nabiximols is a specific extract of Cannabis sativa which contains a range of cannabinoids, of which tetrahydrocannabinols and cannabidiol in approximately equal proportions comprise not less than 90% of the total cannabinoid content. Nabiximols are registered for use in Australia as a buccal spray preparation (Sativex®) as an adjunctive treatment for the symptomatic relief of neuropathic pain in multiple sclerosis in adults. Nabilone is a synthetic cannabinoid used as an anti-emetic in the treatment of nausea and vomiting caused by chemotherapy and also for patients who are not responsive to conventional anti-emetic treatments. Hemp seed oil as defined in Part 1 Interpretation, Paragraph (1) of the Poisons Standard is the oil obtained by cold expression from the ripened fruits (seeds) of Cannabis sativa. Hemp oil, is distinct from hemp seed oil and includes extracts from the flowering tops or leaves or any other part of the Cannabis plant other than the ripened fruit (seeds). Information in the public domain, including websites and literature articles report cannabinoids are not synthesised within the hemp seed. However, traces of delta-9-tetrahydrocannabinol and cannabidiol contamination of the seed may occur due to residual contamination of the outside of the seed coat, even under good agricultural/manufacturing practice. Rigorous cleaning methods, including washing, sieving and shelling, may help reduce or remove any cannabinoid contamination of seeds. 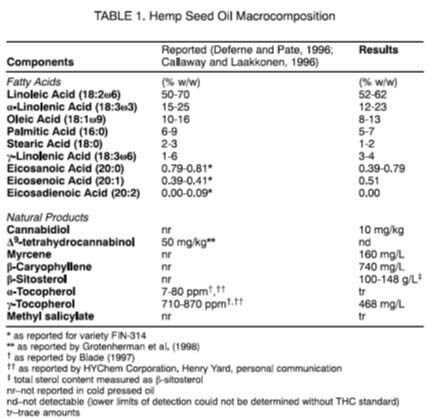 Reported gas chromatography (GC) analytical composition data of hemp seed oil (variety Fedora-19) from Leizer, et al, (2000) includes significant portions of polyunsaturated fatty acids such as linoleic acid, oleic acid, stearic acid eichosanoic acids and palmitic acid, with more than 80% of the content being unsaturated fatty acids. Other trace compounds reported include Vitamin E (tocopherols), β-sitosterol, and terpenes (e.g. myrcene and caryophyllene) and salicylates. Given this information, hemp seed oil products should not contain significant amounts of cannabinoids. The presence of cannabinoids in hemp seed oil is considered to arise from either a contamination or adulteration, rather than be naturally occurring. One submission proposed that Schedule 9 entries for cannabis and tetrahydrocannabinols both be amended to include the following entry: "d) in products for the purpose other than internal human consumption use containing 50 mg/kg or less of tetrahydrocannabinols". in products for the purposes other than internal human use containing 20 mg/kg or less of tetrahydrocannabinols and 50 mg/kg or less of total cannabinoids. in products for purposes other than internal human use containing 50 20 mg/kg or less of tetrahydrocannabinols and 50 mg/kg or less of total cannabinoids. The committee recommended an implementation date of 1 June 2017. The matters under subsection 52E (1) of the Therapeutic Goods Act 1989 considered relevant by the Committee included: a) the risks and benefits of the use of a substance; b) the purposes for which a substance is to be used and the extent of use of a substance; c) the toxicity of a substance; d) the dosage, formulation, labelling, packaging and presentation of a substance; e) the potential for abuse of a substance; f) any other matters that the Secretary considers necessary to protect the public health. There is low risk associated with the concentration of cannabinoids permitted under the exceptions. Hemp seed oil contains fatty acids considered useful as skin conditioners and topical use is low risk, particularly if the level of psychoactive cannabinoid is minimal. Low THC hemp seed oil has been used in cosmetic and pet food products. Limiting human use to 'external only' mitigates against risk of internal consumption of cannabinoids, particularly tetrahydrocannabinols and cannabidiol. The risk of toxicity is minimal in the concentrations permitted under the exceptions Most of the toxicity associated with cannabis is due to the tetrahydrocannabinols (THCs) content. The toxicity will be low if the THC content is low. International jurisdictions have cut-off limits lower than 50 mg/kg; some jurisdictions have as low as 10 mg/kg. Label warning statements 'not for internal use' or 'not to be taken' would apply and make it clear that the products are not for human internal use. Including specific instructions about "Not for internal use" and/or "Not to be taken" makes it clear that oral formulations are not exempted from scheduling. There does not appear to be any evidence of misuse or abuse of the products that currently contain low concentrations of tetrahydrocannabinols/cannabinoids. Limiting the tetrahydrocannabinols content for exemption from scheduling reduces the risk of abuse and diversion. The amendments to the schedule entries would provide clarity and avoid any ambiguity about the products intended to be captured. There is merit in having consistent exemptions across all cannabis and tetrahydrocannabinols entries in Schedules 8 and 9 and the Schedule 4 entry for cannabidiol. the Schedule 4 entry for cannabidiol be amended to include clarification in relation to total content of other cannabinoids. CANNABIDIOL in preparations for therapeutic use containing 2 per cent or less of total other cannabinoids found in cannabis. The proposed implementation date is 1 June 2017. The delegate considered the relevant matters under section 52E (1) of the Therapeutic Goods Act 1989: (a) the risks and benefits of the use of a substance; (b) the purposes for which a substance is to be used and the extent of use of a substance; (c) the toxicity of a substance; (d) the dosage, formulation, labelling, packaging and presentation of a substance; (e) the potential for abuse of a substance; (f) any other matters that the Secretary considers necessary to protect the public health. The delegate acknowledge the committee's advice. There is low risk associated with the concentration of cannabinoids permitted under the exceptions. The toxicity will be low if the THC content is low. International jurisdictions have cut off limits lower than 50 mg/kg; some jurisdictions have as low as 10 mg/kg. Low THC hemp seed oil has been used in cosmetic and pet food products. Limiting human use to 'external only' mitigates against risk of internal consumption of cannabinoids, particularly tetrahydrocannabinols and cannabidiol. Hemp seed oil contains fatty acids considered useful as skin conditioners and topical use is a low risk, particularly if the level of psychoactive cannabinoid is minimal. Label warning statements 'not for internal use' or 'not to be taken' would apply and make it clear the products are not for human internal use. Including specific instructions about "Not for internal use" and/or "Not to be taken" makes it clear that oral formulations are not exempted from scheduling. There does not appear to be any evidence of misuse or abuse of the products that currently contain low concentrations of tetrahydrocannabinols/cannabinoids. Limiting the tetrahydrocannabinols content for exemption from scheduling reduces the risk of abuse and diversion. The amendments to the schedule entries would provide clarity and avoid any ambiguity about the products intended to be captured. There is merit in having consistent exemptions across all cannabis and tetrahydrocannabinols entries in Schedules 8 and 9 and the Schedule 4 entry for cannabidiol, in particular the limits for total cannabinoids and tetrahydrocannabinols. The product exemption applying to products for purposes other than internal human use containing 50 mg/kg or less of tetrahydrocannabinols is being omitted as this is inconsistent with the operation of the Narcotic Drugs Act 1967 (the ND Act) and may be breaching Australia's obligations under the Single Convention on Narcotic Drugs 1961 (the Single Convention). Any manufacture of drugs would be regulated under ND Act, and would require the manufacturer to be holding a manufacture licence and a permit. In view of the recent amendments to the ND Act, the Secretary must refuse to grant a manufacture licence involving cannabis, unless satisfied on reasonable grounds that at least one of the circumstances set out in subsection 11K(2) of the ND Act is met. Thus the end use of the manufactured cannabis under the ND Act is limited for a person to be granted a manufacture licence, irrespective of the concentration of cannabis in the end product to be supplied. Similarly, the cultivation and production of cannabis or cannabis resins are regulated under the ND Act. Any person who manufactures, cultivates cannabis plants or produces cannabis or cannabis resins without a licence may be committing an offence under the Criminal Code Act. Any importation of drugs would be regulated under the Customs (Prohibited Imports) Regulations 1956. The Single Convention does not apply to the cultivation of cannabis plants exclusively for industrial purposes (fibre and seed) or horticultural purposes. However, it applies to the cultivation of cannabis plants for the production of cannabis or cannabis resins, and requires amongst others that the manufacture of drugs be under licence, subject to exemptions, and that trade in and distribution of drugs be under licence, subject to exemptions. The cannabidiol Schedule 4 entry covers only therapeutic use. Therefore non-therapeutic use falls under other Schedule entries for cannabis. The cannabidiol entry amendment is to clarify that the cannabidiol must contain at least 98 per cent cannabidiol relative to the total amount of other cannabinoids in the cannabidiol. Amending the Schedule 9 entries for cannabis and tetrahydrocannabinols to introduce specific limits for total cannabinoids including tetrahydrocannabinols. NICNAS have advised that there are no cannabinoids approved as ingredients in cosmetics (i.e. external human use). Therefore there is no requirement for an exemption, as no approved products exist. This would lead to removal of the exemptions for hemp seed oil from the tetrahydrocannabinols and cannabis Schedule 8 entries and removal of the exemptions for products from the tetrahydrocannabinols and cannabis Schedule 9 and Schedule 8 entries. Food is not considered as part of this decision. The proposed amendments in the interim decision differ from those in the proposal, as well as from the current and previous entries for cannabis and tetrahydrocannabinols. All submissions asserted that the interim decision will have an unjustified effect of capturing certain previously lawful products in Schedule 9, such as hemp seed oil cosmetic products, effectively ending the hemp seed oil industry. In light of recent and ongoing policy developments with respect to cannabis, the submissions suggested that the committee and the scheduling delegates are rushing to implement changes to the Poisons Standard and are doing so without the required level of careful consideration and public consultation. The submissions asserted that there are flaws in the changes to the existing exceptions and cannabinoid content limits proposed in the interim decision, and suggests that these should be the subject of wider industry consultation before any final decision is made. A submission recommended that product and hemp seed oil exceptions be removed from each of the Schedule 8 entries, that the limits for hemp seed oil and other products of 50 mg/kg or less of tetrahydrocannabinols be reinstated, and that no limits for other cannabinoids should apply. Following consideration of the interim decision, advice from the ACMS, and consideration of the submissions received, the delegate has confirmed the interim decision to amend the Schedule9 and Schedule 8 entries for cannabis and tetrahydrocannabinols. The delegate has revised the wording of the entries to ensure clarity of the entries. The delegate has confirmed that the final decision and reasons are in keeping with those for the interim decision. The matters under section 52E (1) of the Therapeutic Goods Act 1989 considered relevant by the delegate included: a) the risks and benefits of the use of a substance; b) the purposes for which a substance is to be used and the extent of use of a substance; c) the toxicity of a substance; d) the dosage, formulation, labelling, packaging and presentation of a substance; e) the potential for abuse of a substance; and f) any other matters that the Secretary considers necessary to protect the public health. There is low risk associated with the concentration of cannabinoids permitted under the exceptions. The toxicity will be low if the THCs content is low. International jurisdictions have cut off limits lower than 50 mg/kg; some jurisdictions have as low as 10 mg/kg. Label warning statements "Not for internal use" or "Not to be taken" would apply and make it clear the products are not for human internal use. Including specific instructions about "Not for internal use" and/or "Not to be taken" makes it clear that oral formulations are not exempted from scheduling. The amendments to the schedule entries would provide clarity and avoid any ambiguity about the products intended to be captured. There is merit in having consistent exemptions across the cannabis and tetrahydrocannabinols entries in Schedule 9, in particular the limits for total cannabinoids and tetrahydrocannabinols. The product exemption applying to products for purposes other than internal human use containing 50 mg/kg or less of tetrahydrocannabinols is being omitted as this is inconsistent with the operation of the Narcotic Drugs Act 1967 (the ND Act) and may be breaching Australia's obligations under the Single Convention on Narcotic Drugs 1961 (the Single Convention). Any manufacture of drugs would be regulated under the ND Act, and would require the manufacturer to be holding a manufacture licence and a permit. In view of the recent amendments to the ND Act, the Secretary must refuse to grant a manufacture licence involving cannabis, unless satisfied on reasonable grounds that at least one of the circumstances set out in subsection 11K(2) of the ND Act is met. Thus the end use of the manufactured cannabis under the ND Act is limited for a person to be granted a manufacture licence, irrespective of the concentration of cannabis in the end product to be supplied. Similarly, the cultivation and production of cannabis or cannabis resins are regulated under the ND Act. Amending the Schedule 9 entries for cannabis and tetrahydrocannabinols to introduce specific limits for total cannabinoids including tetrahydrocannabinols in hemp seed oil. The delegate noted the public submissions, however, has confirmed that the final decision as amended and reasons for the final decision are in keeping with those for the interim decision. "'Hemp seed oil' means the oil obtained by cold expression from the ripened fruits (seeds) of Cannabis sativa". Thus, hemp seed oil can only be made from hemp seeds, and not any other part of the Cannabis plant. Hemp seeds naturally contain only trace amounts of tetrahydrocannabinols and cannabinoids, however a very small quantity of tetrahydrocannabinols and cannabinoids are permitted to allow for any minor contamination with other parts of the Cannabis plant. Hemp oil, on the other hand, can be made from any part of the cannabis plant. As flowers and leaves are high in tetrahydrocannabinols and other cannabinoids, they are captured by the Schedule 9 entries for Tetrahydrocannabinols and Cannabis. It is for this reason that hemp seeds are exempt from the Narcotic Drugs Act 1967, and the Single Convention on Narcotic Drugs 1961, while hemp oil is captured by the Narcotic Drugs Act 1967 and the Single Convention on Narcotic Drugs 1961. A submission raised the issue of Beta Caryophyllene (BCP) being a cannabinoid from their perspective and hence affecting the scheduling of this substance. Research by the secretariat has confirmed that Beta Caryophyllene is a terpene that is a selective agonist of cannabinoid receptor type-2 (CB2) and for the purposes of this scheduling entry, the delegate does not define BCP as a cannabinoid. Cannabis sativa seed oil 8016-24-8; 89958-21-4 Hemp seed oil 10 µg/g THC (delta-9-tetrahydrocannabinol), as per the Industrial Hemp Regulations. This restricted level for THC in cosmetics is equivalent to 10mg/kg. Cannabidiol products with 98% of the cannabinoids in the products being cannabidiol are Schedule 4 for therapeutic use. As cannabidiol is absorbed through the skin it is not appropriate that hemp seed oil should have be allowed to have any significant amounts of cannabidiol, noting that there should only be very minimal amounts in hemp seed oil. In view of this, it is appropriate to have maximum amounts of cannabinoids and tetrahydrocannabinols in hemp seed oil noting there should only be very minimal amounts, if any in the hemp seeds from which the oil is sourced. As noted previously it is not appropriate to have any other 'products for purposes other than internal human use' exempt due to the issues around the ND Act and Single Convention. The delegate noted that Food Standards Australia New Zealand (FSANZ) has recently reached a decision on the use of low THC hemp seeds as food. The Poisons Standard applies access restrictions on all poisons where there is a potential risk to public health and safety. Food that is covered by a food standard issued by FSANZ, and complies with the food standard, is exempted from the Poisons Standard by its' inclusion in Appendix A. While this was taken into consideration by the scheduling delegate, it was not the reason for this scheduling decision, and may be reconsidered at a later date. 1 October 2017 to remove "in products for purposes other than internal human use containing 50 mg/kg or less of tetrahydrocannabinols." from the tetrahydrocannabinols Schedule 9 and Schedule 8 entries. 1 June 2018 for all other changes. The November 2016 Poisons Standard contains an error, referring to 'cannabinols' instead of 'cannabinoids' under the Schedule 9 cannabis entry at item c. This was corrected in the February 2017 update to be consistent with the August 2016 decision, pending the outcome of the advice of the committees.